Entrance of the Theotokos Skete - What is a Skete? A skete is a small monastic community following a typicon, or rule, designed to encourage the pursuit of inner stillness by means of a concentrated focus on the practice of the Jesus prayer. The Divine Liturgy is served regularly, and common worship is undertaken according to the normal liturgical calendar of the Orthodox Church. In addition to this liturgical life, monastics living in a skete are encouraged to spend as much time as possible in solitary prayer. Many of the monastic and patristic Fathers of the Orthodox Church consider monastic life in a skete to the "middle road" of spiritual struggle, combining the benefits of community life with those of eremetic life, while avoiding some of the problems of any extremes. What is the purpose of a Monastery or Skete? 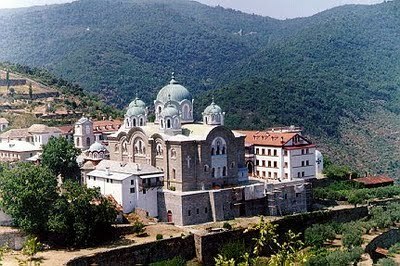 Historically, monasteries have always been at the core of the Orthodox Church. They exist for the salvation of the monks and nuns who live there, as well as providing an oasis for the Faithful to center themselves in Christ, away from the pressures of everyday life. Monastics follow the early examples of the Prophet Elias, St. John the Baptist, and many others...giving up all they own for the Lord and relying on Him to provide for their needs. The prayers that monastics offer for us comfort our hearts, bring peace to our minds, and guide us towards Salvation. Whenever monastic life is flourishing and healthy, the spiritual life of the laity is also flourishing and healthy.